After my somewhat successful hemstitching experience, I have cut my undulating shadow weave off the loom. I wet finished it in cold water. I let it soak for about half an hour in the washing machine, agitated briefly, and then put it on the spin cycle. I ironed it while still damp. This softened the fabric beautifully. ..... a rotary cutter which I found in the quilting department at the local big box store. It made trimming the fringe a breeze. I think this is the first time I actually got even, straight fringe. No more eyeballing with scissors for me! In looking at it I'm now thinking more of a shawl than a table runner. Either way I am very pleased with it and interested in exploring undulating shadow weave a little more. I have a few ideas to vary it somewhat, so hopefully I'll have another project on the loom soon. That is just beautiful. I know nothing about weaving, but it looks like a very professional job. Very nice indeed! Like the fringe cutter....still an eyeballer with scissors myself. Sigh. Very nice. The one thing I enjoyed in weaving was the finish hem. I do think if you are going to put the time and money into a product your finish should be as nice. Yours is very nice. Great color also... wish I could see it and feel it in person. Beautifully done! I always use my rotary cutter to cut my fringe. 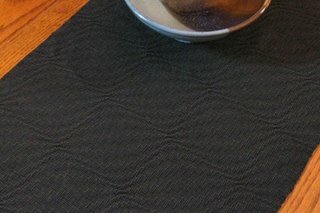 Do yourself a favor though and pick yourself a clear 24" long quilters ruler so you can lay it across and cut across the entire length of the fringe in one swoop. 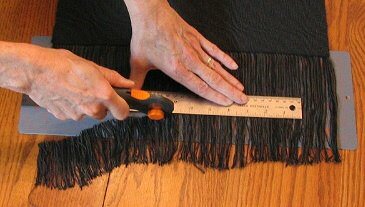 Makes it easier to get the fringe straight all the way across because you can line up the lines on the ruler with the hemstitched edge of the piece. The effect of the weave is just awesome. I love how it looks! And aren't those rotary cutters great? So convenient. How very beautiful! You've made it seem so much easier than I'm sure it is. And thanks so much for the rotary cutter tip. I've had one of those things kicking around for years (as well as the 24"x6" clear plastic ruler) and have used it to cut a variety of things, but never fringes. I feel silly now for not having figured this out myself. Only 4! It is in Margaret Winderknecht's Color-and-Weave II, page 80. I love it. It's beautiful. The colours you chose are perfect for it, subtle and sophisticated. Oh, a rotary cutter! What a great idea. I use the rotary cutter too. Makes it easier. The shadow weave is lovely. Do you have closeup pictures?